← Why In the World? 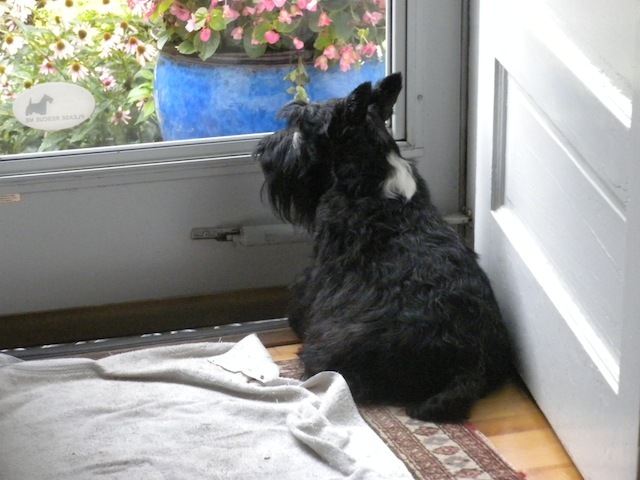 Image | This entry was posted in dog photography, photos of dogs, Scotties, Scottish Terriers, Terriers, The Scottie Chronicles and tagged dogs, pets, Scotties, Stuart the Scottie. Bookmark the permalink. Does that sticker on the door say “Please Rescue Me”? If so, Kali, Kaci and I will be right over to do so. Whew. Thanks, pals. That is indeed what it sez. is the towel for your muddy paws? We have one (or three) as well. Good day to you, Stuart. I have so many, it’s hard to keep track. And today I’ll need them all! Today is the first day of a brand new week! Let’s hope it means we have better weather, good news throughout the world…and eating more green beans! Are you on guard duty? Silent until a squirrel appears…we bet. Ya look deep in thought. A thoughtful lad I am. are you waiting to be let out again? Probably. I do love to stare though. What beautiful flowers our your door, Stuart! They’ll be back soon enough. They will indeed. It’s supposed to snow this week! Is somefinks interesting going on ? Always. Like watching TV isn’t it? Woops! Sorry I missed this yesterday, pal. What are you looking at out there? is it something chasable? Always. Even a kitty or two…..